Privilege has become a serious area of inquiry in recent years. White privilege and male privilege have hit the spotlight, as has racial disparities in police brutality and the #MeToo movement highlighting workplace harassment and sexual assault. Privilege is a complex phenomena to understand and even harder to teach. But, if we are really going to unravel racism or sexism, we know we have to include the privileges those problems support. 1) I use as much tap water as I choose for my daily activities, such as bathing and cooking, without thinking about it. 2) Year round, I eat fruits and vegetables that are not grown in the region in which I live. 3) I control the temperature of my home for my own comfort. 5) I have access to beautiful views of nature where I live, work, or play. 6) I breathe clean air at home, school, and work. 7) My trash is hauled far away from my home. 8) I drink clean water. 9) I feel safe in the outdoors near my home. 10) When I go to parks or nature preserves, I see people who look like me. Raising awareness on privilege—beginning with oneself—is one important way for students to learn about environmental justice. Coupling this reflection with data on environmental injustices—asthma rates, lead exposure, or proximity to landfills—is an important beginning place. This data brings to life the documented disparities for women and people of color in the United States. But this data is rarely enough. All of us can reflect on our own experiences and contributions to these systems to begin to imagine the possibilities of change. Environmental justice is a key social problem of contemporary society, but like issues of race or gender, it is hard to teach about justice without recognizing the flip side: the privileges some people in society have. Like we have learned from our efforts to dismantle racism and sexism—where white people begin to identify the privileges of being white and men begin to recognize the privileges of being male—Black Lives Matter and #MeToo have brought what were once abstract concepts into the lived realities of people lives. Elevating the understanding of the injustices experienced by people, and simultaneously asking those with more privileges to reflect and consider ways to dismantle their own privileges, is one method of social change. Environmental justice is similar to social justice in this way. Dismantling the power structure includes recognition of privileges and the replacement of privileged behaviors with new behaviors focused on equity. After all, we teach about environmental justice because we want to change the experiences of people, and we want our students to infiltrate and modify the institutions and organizations in which they will work and lead. When we reflect on our own privileges and see the data, we can begin to see the ways it can be changed, and even more importantly, that we have the responsibility to do the changing. Featured image credit: Tree vs. concrete by Paweł Czerwiński. CC0 via Unsplash. Christina L. Erickson, PhD, is Associate Professor of Social Work and Environmental Studies at Augsburg University. Her work explores the intersections of social work as an applied profession and the experience of humans in their natural, social, and economic environment. Dr. Erickson views social work knowledge, skills, and values as essential to responding to and ameliorating environmental degradation. 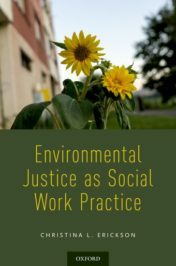 She is the author of Environmental Justice as Social Work Practice (OUP 2018), a textbook designed to bring an understanding of environmental privilege into the social work curriculum.